Garden Centre – Machinery Centre - Restaurant. Just off the A169 near Pickering. The Steam and Moorland Centre can be seen as you approach Pickering on the Malton Road (A169). 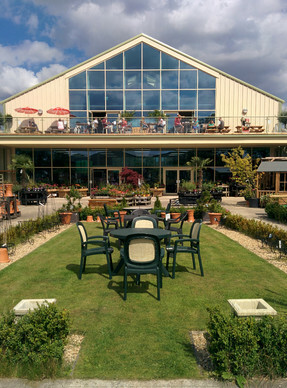 The Garden Centre was opened in October 2001, and serves the people of Ryedale and surrounding areas with all sorts of gardening requirements such as Plants, Sheds, Greenhouses, Seeds, Gardening Sundries, Giftware, Country Clothing and Footwear, Garden Furniture, Pots, Birdfood etc. The Machinery Centre opened in 2006, and sells and services all kinds of garden machinery – petrol, diesel, electric, robotic. All sorts of brands from Husqvarna, Hayter, Toro, to Bosch and Flymo. The “Engine Shed” Restaurant opened in April 2015, and can seat 150 people with additional seating for 50 on the South-facing balcony. The “Engine shed” boasts, ample Free Parking, Free Wi-fi, Licensed restaurant, Ground-source under-floor heating, model railway, lovely views, helpful staff, loyalty card scheme and of course, fantastic value for money meals, coffees, teas, cakes, afternoon teas etc.